Here's my 2nd card for today. More paper and stickers from The Paper Studio. This was a pack that I got when I first started in card making. I've also had my Metallic Art Pencils from Stampin Up for quite a long time, I guess these were waiting on the shelf for just the right project. It all came together today when I found this free digi download on Cards For Men. The artist is Claire from Hope Jacare. I've been a big fan of hers after she had become a follower of mine and I went to visit her and quickly became a fan and a follower. I just love her style. These metallic pencils were perfect for this fish. I colored with light green and shaded with a blue green then blended all together with Windsor and Newton Sansodor(low odour solvent),filled in scales with gold gel pen and redotted the black dots with a fine point sharpie pen. I do believe he's a very handsome fish. Thanks Claire for the free digi! I'm starting to get the hang of digi's so it's starting to be more fun. Cute Card Thursday Challenge 111-Boyz to Men! 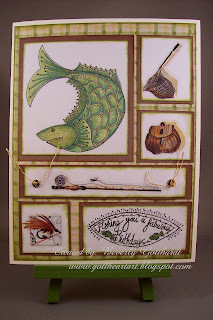 Supplies: Ivory Card Blank 5" X 6 1/2" Halcraft, Papers: The Paper Studio, Stampin Up-Whisper White, Digi Stamp, Ink: Stampin Up-Old Olive, Stampin Up-Metallic Art Pencils, Stickers-The Paper Studio, eyelets-The Paper Studio, gold jewelry cord, Sakura Gel Pen-gold. Great card, Beverley. Yours is the first card to use the free digi so well done. Couldn't resist commenting on your card as it's so gorgeous. 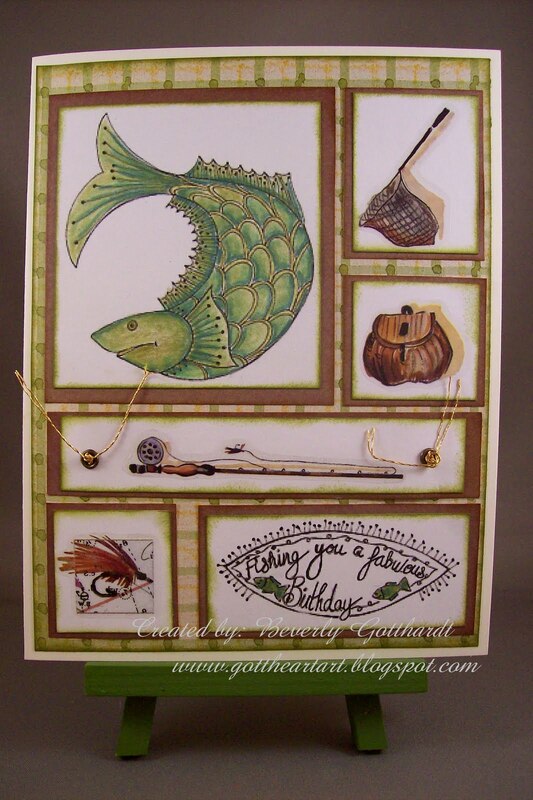 A great card Beverley, I love fishing with my nephews so particularly appreciate the theme! wonderful job. love the way you layed everything out. good luck on the challenge. thanks for playing with us at Cards for Men. Gorgeous, Beverley, youve done this image proud..